4 Outdoor Home Improvements Worth the Cost - YoursTrulyHandmade.com - DIY, Home Rennovations and a lot of crafts! Homeowners, next time you’re thinking about making improvements to your home, look outside. Your outdoor areas serve as your home’s first impression to onlookers and neighbors. And, many outdoor home improvements, like a fresh coat of paint, for example, can even boost your property’s overall value. Here are a few outdoor home improvement ideas to consider for your next project. Painting your home is a smart way to refresh its look and boost curb appeal. When it comes to choosing colors, however, some are perceived more favorably than others, especially when considering return on investment. For the most bang for your buck, choose paint colors that boost your home’s value. And remember to keep it to three colors of less. Follow the 60-30-10 rule, with 60 percent as the body of the home, 30 percent as the trim and garage door and 10 as an accent, like your front door, for example. Some expert color combinations include aqua, royal purple and crisp white, as well as cool green, butter yellow and pure white. Ideal for creating the perfect ambiance and also adding security to your home, outdoor lighting is a worthwhile investment. There are many styles of outdoor lighting to consider. Like any home project, installing outdoor lighting takes a little forethought and proper planning. Rather than installing a single floodlight above your garage, consider a lighting plan. A thorough lighting plan can illuminate varying areas of your outdoor space, from the trees, flower beds and garden walls to the facade of your home and other focal points. A great option for flower beds, canopy-style lights also work well as pathway markers. And downlights can be aimed at your lawn or pathways to keep your yard lit when it’s dark. And outdoor space is meant to be enjoyed and shared with your friends and family. Creating a gathering space for the ones your love can make your backyard a place where everyone will want to spend time. Consider adding a fire pit to your backyard for fall and winter season campfires. 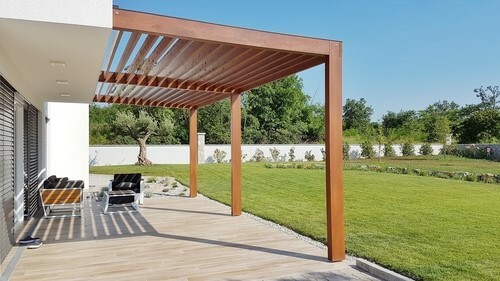 Or a stylish pergola for shade and architectural interest throughout all of the seasons. Your entertaining space should feel inviting, and be sure to let your own design preferences shine through when you’re adding the final touches to the space with patio furniture and other accessories. Want your home to make a standout first impression? Look to your landscaping. Not only can landscaping make your yard look great, it’s a good investment. In fact, landscaping can increase the value of your home by up to 20 percent. When it comes to landscaping, it’s important to know the basics. Great landscaping goes beyond planting, softscaping and installing features like fences and garden paths. Oftentimes, for the best results, assistance from a landscape architect or contractor may be required. However you approach landscaping in your own yard, be sure that you have a plan before you start clearing areas and planting. This can make the space appear disorganized. A professionally drawn plan can keep it organized, and can keep you within your landscaping budget. There are a variety of ways to customize your outdoor living spaces, all while maximizing your property value. Whether you opt to paint your home or create inviting entertainment areas, these outdoor improvements can not only prove to be a worthwhile investment but make your outdoor areas more enjoyable.